What Is a Herbaceous Perennial? In gardening terms, a perennial is any plant with the potential to live for three or more years when grown in the right conditions. A herbaceous perennial is one with a permanently soft, fleshy stem as opposed to a woody stem, which a shrub or tree has. Cold tolerance dictates a perennial's lifespan. 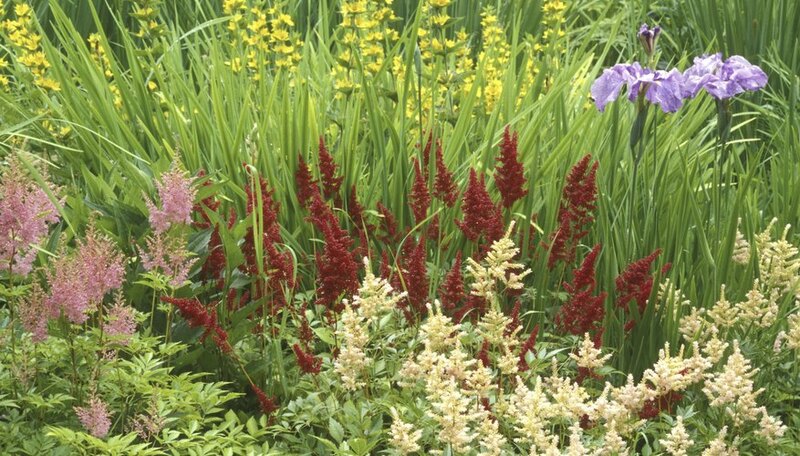 Some herbaceous plants that aren't perennial in cold-winter climates make the list in mild-winter ones. Others, called tender perennials, survive winter only when moved to protected locations or when their food-storing underground parts are lifted and stored for replanting in spring. The U.S. Department of Agriculture's Plant Hardiness Zone Map conveniently divides geographical areas according to their coldest average winter temperature. Herbaceous perennials are marketed with the range of USDA zones they're suited for listed on their labels, with the low zone number being the coldest suitable zone. Hollyhock (Alcea rosea), which is perennial in USDA zones 2 through 10. Lily-of-the-valley (Convallaria majus), suitable for USDA zones 3 through 8. This plant can become invasive; either grow it in a pot or surround it with a root barrier to prevent it from spreading. Columbine (Aquilegia canadensis), perennial in USDA zones 3 through 8. Snapdragon (_Antirrhinum maju_s), which handles winter cold in USDA zones 7 through 10. Gerbera daisy (Gerbera jamesonii) for USDA zones 8 through 10. Garden verbena (Verbena x hybrida), perennial only in USDA zones 9 through 10. Tender herbaceous perennials include canna lilies (Canna spp.) and dahlias (Dahlia spp.) With protection or lifting, they're hardy in USDA zones 7 through 10. The first cold damage of the growing season occurs during a light freeze, with the temperature 29 to 32 degrees Fahrenheit. A light freeze kills tender annual flowering plants, vegetables and herbs but has little effect on perennials. In a moderate freeze, the temperature falls to 25 to 28 F, killing all annuals and freezing the tops of some perennials. Ice crystals forming in the frozen tissues block the flow of water. So the damaged areas appear saturated before shriveling and blackening. A hard freeze, with the temperature dipping to 24 F or lower, kills hardy herbaceous perennials back to the soil. Their roots or crowns -- the dense stem tissue just above the soil line -- survive and resprout in spring. Garden strawberry (Fragaria x ananassa), hardy in USDA zones 2 though 11, depending on the variety. Creeping saxifrage (Saxifraga stolonifera), sometimes called strawberry begonia and strawberry geranium; hardy in USDA zones 6 through 9. Hens and chicks (Sempervivum tectorum), succulent plants hardy in USDA zones 3 through 8. Some perennial bulb plants reproduce by manufacturing bulblets, or naturalizing. Common naturalizing bulbs include crocuses (Crocus spp. ), suitable for USDA zones 3 through 8, depending on the variety, and grape hyacinth (Muscari armeniacum) and daffodils (N_arcissus_ spp. ), both hardy in USDA zones 4 through 8.
eXtension.org:How Is Hard Freeze Defined? What Are the Most Fragrant Perennial Plants for Zone 5? Are Dahlias a Perennial Flower? What Comes Back in Your Vegetable Garden Every Year?